Place the pot over high heat until the water comes to a full boil. IMMEDIATELY take the pot off the heat and cover with a tightly-fitting lid. The eggs do not need to be… and should not be… boiled. They will cook from the heat of the water. Boiling causes the iron in the yolk and the sulfur in the white to combine, and this is what makes that ugly greenish color around the yolk. Let the eggs sit in the pan in the hot water for 12 minutes for medium, 15 minutes for large, and 18 minutes for extra large. This timing is very important. Drain and re-fill the pot with cold water. I like to empty and re-fill the pot several times to make sure the heat of the eggs doesn’t heat the water back up again. You can also put ice cubes in the water. The water should be very cold. Letting the eggs sit in the cold water until they are completely cooled helps the papery membrane stick to the shells, making the eggs easier to peel. Let the eggs cool completely, then gently tap the large end of the egg against a flat surface like your kitchen counter. This should crack the shell. Crack the other end… the shell should peel off very easily. 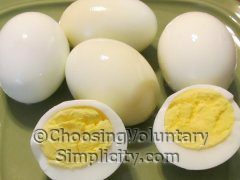 Hard boiled eggs in the shell can be refrigerated up to one week. Hard boiled eggs out of the shell should be used right away. I tried it and IT WORKS! I had the easiest to peel eggs I have ever made. I couldn’t believe it!!!!! I will forever be grateful to you for this hint!!! I tried it, too, and it worked great for me, too. I always have the worst time with peeling eggs, but today the shell slipped right off. Thank you for sharing. I have to admit that when I read this I was pretty skeptical and didn’t have a lot of hope that it would work. I have never had great luck peeling hardboiled eggs and didn’t really think following your instructions would help much but to my surprise they did! Thanks! I have done eggs like this for a long time, and it still surprises me how easy this method is and how well it works. Thanks for the tips! I try to save back eggs to hard boil. I find the older eggs are just so much easier. Even the ones from the store don’t peel well at first, but I will try this next time I want to hard boil eggs and don’t have any old egggs. Thanks for the tips :D I can never get hard-boiled eggs right, I will try this way next time. I’ll have to try taking them off immediately because last time I made eggs I did the cold water thing and the shells still were messy. Not only were the eggs easy to peel but they were delicious! I had forgotten just how tasty a hard-boiled egg could be…. The age of the egg is the most important factor in ease of peeling, and overcooking is the main reason for a discolored yolk. I followed all these steps. The eggs were about 5 days old. Even though they were perfectly cooked, the shells were impossible to remove… most of the whites came off with the shell. They were large eggs and I let them sit for 15 minutes after I took them off the heat (immediately covered the pan). Don’t know why it didn’t work. Diane, I would guess that your eggs were still a little too fresh. It’s also possible that your eggs didn’t get cooled down quickly enough… it’s hard to know. Usually this method works great. Thanks. I want to try this, but I’m boiling ALOT of eggs to make deviled eggs for a party. Will an amount such as 2 dozen eggs alter the success of this technique? Anni, this technique works for any number of eggs. After they are done boiling . Run cold water from the faucet over them and let them cool off soaking in he pan with cold water for a while then try peeling them. Wow! They were easy to peel and looked and tasted perfect! The yolk was bright yellow with no trace of green and was moist with a perfectly homogeneous texture and consistency. I was a bit skeptical because I have never had a good experience with boiling eggs. Thank you! Thank you mucho – I finally understand what I have been doing wrong and now intend to do a great big egg salad. I am going to try this method right now since I cooked 24 eggs earlier and only ended up with 6 which I was able to remove the shell. Thank you, Thank you. Although I still had some difficulty with a number of eggs, this method was significantly better. I only had to pitch 1 egg. I posed the question on Facebook and what a great response. I think your method makes the most sense. I am using organic eggs and was boiling them for 10 minutes. I will now revise my technique as most people let them sit for at least 10 minutes after bringing to a boil. There was some conversation about FRESH eggs not peeling well. This is the BEST process for making easy peeling eggs. TWO THUMBS UP!!!! Thanks so much!!! You are kidding, right??? What other secrets have been hidden from me? I haven’t had homemade egg salad, tuna salad or deviled eggs since my Mom died a few years ago. The hard boiled eggs were too much to deal with. I just tried this and the shells practically fell off the eggs. You are my hero!!! I will be pigging out on homemade tuna salad tonight. Thank you, thank you! Now if someone comes up with an easy recipe for soft boiled eggs, I will be in heaven. It worked wonderfully. Perfect yellow center. The shell came off without the egg attached. Thanks for Sharing! This method results in the most tender perfect eggs with a beautiful yellow yolk. I learned it from Julia Child who borrowed it from the Georgia Egg Board. They even recommended poking a small pin hole in the bottom of the egg to help with the expansion of the shell or the contraction of the egg inside the shell…I can’t remember which it was. They also have you put the eggs in an ice water bath for two minutes, then back in boiling water for 10 seconds, then back in the ice water again. It’s a bit tedious. I will try the very cold cooking water and just the one (longer) ice water bath next week for Easter and see how that goes. But I do have to say…I have done the Julia Child recipe many times and the most important factor for easy peeling is that older eggs definitely work best. Eggs you buy at the store same day will be a nightmare to peel even if you follow directions to the letter. You didn’t do anything wrong. Hint: buy your Easter eggs a week or two early! Another caviat to knowing the eggs are old enough is thatthey will stand on end in the water where fresh eggs will lay on their sides in the water. Best eggs to peel expecially for coloring easter eggs. very yummey. u sould try it.expecially the people who never tried it yet. if you dont believe that recipe. it really works. so try it. One more tip, crack the big end, then roll the egg around so the shell gets all crackly. Peel the big end off, then using a teaspoon wiggly pry it under the shell and it will all pop off. No little bits left, and simple for those who have hand nerve issues. I must say that I used to do this when I was younger and pretty much forgot over the years…but once again this is the only way to hard boil an egg and be able to peel…thank you so much for the reminder! Too many people rush through the process. They fill a pot with water, dump in the eggs, flip the burner on high, and end up leaving the eggs in the boiling water under the impression that they are cooking the eggs when in fact they are ruining the dish. Shirley’s method allows for time to relax, talk with your family (while the eggs and water temp. are equalizing). Now that the temperature has equalized, you put the eggs in new water, turn on the burner and you are feeling relaxed. The water comes to a boil quicker because the heating element is not in battle with the temperature of cold eggs. Such a nice transition isn’t it? Now the water has boiled, you cover and remove from heat, set your timer, and you go and relax some more with your family, play with your dogs. I could go through the rest of the process but I think you see where I am going. 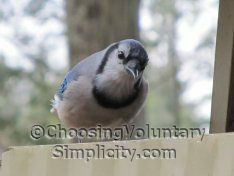 This method of simplicity eliminates the stress. The eggs do come out very nicely cooked, they do peel much easier. It’s all about patience. Taking your time. After all, what’s the rush when you are trying to live a simplistic life anyway? I used this trick and it works so well. I was fairly surprised. and I thank you so much for making my parties that much easier to complete! thanks for this post! I’ve been experimenting with using the cooktop less but hadn’t quite hit on the perfect timing with hard-boiled eggs. I LOVE hard-boiled eggs and don’t make them very often because they are such a pain and I either overcook or under-cook them. Excited to try these tips today!! Sheesh… about the only thing I’ve been doing right is cooling down the eggs after cooking ’em. Admittedly, I’ve had a few greenish yolks (yep, guess I was over-cookin’). But I never knew not to cook fresh eggs, and I also didn’t realize to temper the eggs before cooking. Can’t wait to see how my next batch works out! Well… in a few days, since I just brought these eggs home today. ;-) Thanks for these tips! perfect!!!!!!!!!!!!!!!! I had tried everything before this it works! I just tried this method with “new” eggs (a few days old) and they were IMPOSSIBLE to peel – though perfectly cooked. If it makes any difference, these are organic, cage-free, brown eggs. I will try to do the experiment with old eggs – unfortunately, my wife refuses to eat any egg that has been in the fridge more than a week, no matter how hard I try to convince her that they are just fine. This is how I also make my hard boiled eggs – except for the cold water at the end. I just can’t bring myself to waste water letting it run or replenishing several times. An alternative to this is to just put the cold water in once and then put ice packs (that you normally put in your lunches)in the pot. You can swap out a few ice packs if the water warms up. Of course – the water is then reusable for watering your plants or your animals. Well, after just fighting with hard-boiled eggs to get the shells off (one dozen colored Easter eggs and about 30 minutes!) I decided to Google to see what the rest of the world does to get the shells off easily. And, to my surprise, there are many great successes on this site. I was so glad to see happy messages! My neighbor actually cooked the eggs, so I don’t know how long she cooked them or what method she used (she’s 79 years old). I’ve always been told to put salt in the water, cover the eggs with cold water + about one inch, and put them on to boil forever! Well, that tells you why I have problems….. hard to shell the eggs, big chunks taken out, and green egg yolks, plus much frustration! So, the next time I do eggs, I will follow these instructions exactly. I’m so excited. I’m 68 years old and “stuck on stupid” when it comes to boiled eggs. Why didn’t I check the Internet 20 years ago! Think of the frustration I could have saved myself. Thanks for the great tips and responses. I’m forwarding these to all my friends also. Bon appetite! Works great! Running under cold water while peeling helps, too. Now that I am over 70, I find I remember to do this method and I use a timer every time. Then you won’t” forget” you have eggs on the stove. I have been doing eggs like this since I was a teenager. My Mother taught me how. Hang on a minute my timer is going off. Thanks for letting me know the exact minutes needed. I use both a 1950s Sunbeam egg cooker and a 1970s Oster egg cooker (which looks a little like a flying saucer). These both steam about 6-8 eggs in 10 minutes, and regardless of the size or age of the eggs, the steamed eggs cook and peel perfectly every single time. I’ll never ever boil eggs again. I was surfing the web on helpful hints and ran across your article “Easy To Peel Hard Boiled Eggs. Great hints. But pls allow me to add another tip to ease the task of peeling those eggs. After cracking the egg, use a small spoon (curved side toward the egg) and run it between the shell and the egg. The shell slides right off of the egg. Makes peeling eggs so simple and prevents the shell from sticking to the egg white (which causes the egg white to tear). You are an absolute GENIUS! Thank you so much for posting. I have a super large family and I’m in charge of the deviled eggs for holidays and special dinners – 7 dozen each time to be exact. The shells literally slid off the eggs. On the few that didn’t, the membrane was “tough” enough to grab a piece to get the process going. The result: a monstrous amount of beautifully smooth deviled eggs and NO cut, sore, skin-cracked fingers! Woohoo…I don’t know you but I know I love you! Thanks again.